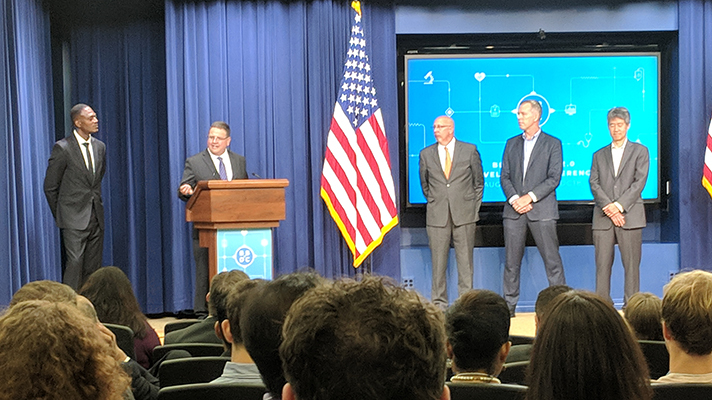 WASHINGTON, DC – A broad coalition of technology giants took the stage in an unscheduled session at the Blue Button 2.0 Developer Conference here in the White House. Specifically, Amazon, Google, IBM, Microsoft, Oracle and Salesforce came together to pledge to remove interoperability barriers. Dean Garfield, CEO of the Information Technology Industry Council, lead the session and described the pledge as "making a commitment to eliminate the friction that exists in the healthcare systems today," based on "cloud computing and cloud architecture moving toward open standards through FHIR and the Argonaut project." While the companies did not delve into further details, Microsoft Corporate Vice President Peter Lee said his company is committed to removing all barriers to the interoperability of health data. "We see this as a historic moment where we can intervene in just the right ways as healthcare shifts to the cloud and makes AI available," Lee said. Gregory Moore, Google’s vice president of healthcare and life sciences, said the company is also committing to enabling connected care. And IBM's Head of Global Product and AI Mark Dudman echoed the sentiment: "Patients should have access to their data and have the flexibility to use products and services across different systems to work seamlessly for their care."